About this time last year, I remember watching a television interview on CNN by an American reporter covering our war in Afghanistan. He was speaking to a soldier of the Northern Alliance through the help of an interpreter. In the course of the interview, the reporter drew a map of the United States and a decent map of the globe to explain to the soldier that he was an American from the New England area and also to give him an idea as to where America was situated in relation to Afghanistan. After awhile, the reporter realized that his drawing made no sense to this soldier because the soldier had no idea that the world is round. It was amazing. This soldier had never been told or taught that the world was a sphere. The reporter, understandably, took this for granted. Excuse the pun, but it seems that the two men were worlds apart. The reason I tell this little aside is to demonstrate the fact that many persons, Christian and non-Christian alike, take the story of today's Gospel for granted as well. It's a narrative with which we are perhaps all too familiar with. We do well to take a closer look - to open up the Scriptures and see what was going on. The Annunciation is one of my personal favorite scenes in the Gospel because it is the model for every disciple's decision to be open to God's will. If you ask any priest or religious, they will tell you that their vocation story is encapsulated in the story of the Annunciation because every person consecrated to celibate chastity for the sake of the kingdom takes Mary as their model for giving up their legitimate right to natural generation of humanity so that divinity may be born out of them. The difference with Mary, of course, is that she bore both divinity AND humanity in the person of Jesus - not a fusion of two persons, human and divine but rather - a divine person, the second person of the Blessed Trinity, taking on human nature. The Fathers of the Church tell us that the Annunciation, which is the scene depicted in the Gospel today, ranks among the most important events in human history, right up there with the Crucifixion and the Resurrection. It is said that the Annunciation was the moment in all of human history when the angels held their breath in anticipation of Mary's response to the invitation to become the Mother of God. Mary could have said, "no." She was perfectly free to do this. Like any human person, she had an intellect and free will. But we know how the story ends up. Mary gives her assent and the course of human history would be changed forever because her Son would go on to redeem the entire human race. In effect, Mary at the Annunciation, conceives Jesus through the power of the Holy Spirit in her heart by faith before she conceives Him in her body by flesh. Mary's yes to life makes her the consummate pro-life model. There is no hesitation with God's plan but total trust in His infinitely wise design. Mary does not seek to have total control over her life nor assert her will over God's will. She is totally receptive to the conception of life in her womb - and that has made all the difference for us. In our own day, this total openness to God's will in matters of marriage and family is at times, so counter-cultural vis a vis our contraceptive culture. Mary must have known that accepting the invitation of the angel would have put her in a crisis pregnancy. After all, she was not married and being found pregnant without a husband could have been grounds for the death penalty by stoning. Yet, she accepts the invitation in total freedom and joy. Towards the end of the angel Gabriel's visit, Mary makes her response. She says, "I am the handmaid of the Lord. Let it be done to me according to your word." This response is one of total humility. Like all the virtues, humility is found both in the intellect (in the mind) and in the will (in the heart). When Mary says that she is the handmaid of the Lord, she is repeating the famous words of Hannah from the Old Testament in an old Jewish hymn sung by women who were expecting. Mary, in her intellect, recognizes that she has been chosen by God for a unique role in salvation history. But humility does not end in the intellect - it is not merely mentally accepting the truth about a situation. Humility must also be an act of the will. Thus, when Mary says, "fiat" or "be it done to me according to thy word," she is accepting or willing the message of the angel and taking ownership of it. This is where her hope (or trust) and her love (or charity) enter in. So, humility starts as a recognition in the mind and flows into the heart as an act of the will. When Mary accepts the invitation to become the Mother of God, she is, in effect, taking on the responsibility of making Jesus Christ visibly real and present in the world. God enters the human scene in this extraordinary way. We do well to ask ourselves if we respond to God's invitation to make His Son real in the world by the manner of our lives - to make Jesus really relevant to those who have not really met Him. Last Sunday evening, I accepted an invitation to attend a Christmas party held by one of my friends from college and her three housemates. Typically, I turn-down such invitations because I try to restrict the number of Christmas parties I attend in Advent, to be more faithful to the liturgical season, but in this case, I almost turned down the invitation because I knew that by going to the party, I would be taken out of my comfort zone. You see, when I'm in the friendly confines of this parish or in the homes of Catholic young and not so young-adults, I often feel like the character, Norm in the once popular sit-com, Cheers. When Norm walks in the bar, everyone screams, "Norm" or in may case, "Father". Everyone knows my name. In such scenarios, I am not an anomaly or an enigma. However, when I walked into that party last Sunday night, I was anything but familiar - I could feel the stares on my collar when I walked into that party. This is what I call working in the vineyard - maybe overtime. Besides the fact that I was "ambushed" by a woman who insisted that I account for all of the recent Church scandals and another guy who was trying to convince me that joining the Masons was a good thing, I came to realize that there are still so many people in our city who do not know Jesus. I often wonder what each of us is doing to make Jesus real to others outside of our comfort zone. Mary stepped out of her comfort zone by accepting the invitation to be God's mother. How willing are we to do our part? For ourselves, we experience our own Annunciations - when we have to make major decisions and need to be able to listen to what God desires of us - for example - when we discern over our vocations or our careers. But those are rather infrequent when compared to the mini-Annunciations - those times when God is trying to speak to us through our work, our families, our friends, our Church. Mary was able to be receptive to God's will because she had a keen spirit of recollection - always on the lookout for God working in her life; always sensitive to God's will in all things. We should ask if we have done our part, by God's grace, to cultivate a spirit of recollection before Christmas OR are we, at this point, just so exhausted because of all of the business of the season and the details of getting ready in matters non-spiritual. If we're not ready, all is not lost - there is still time. We have 48 hours. 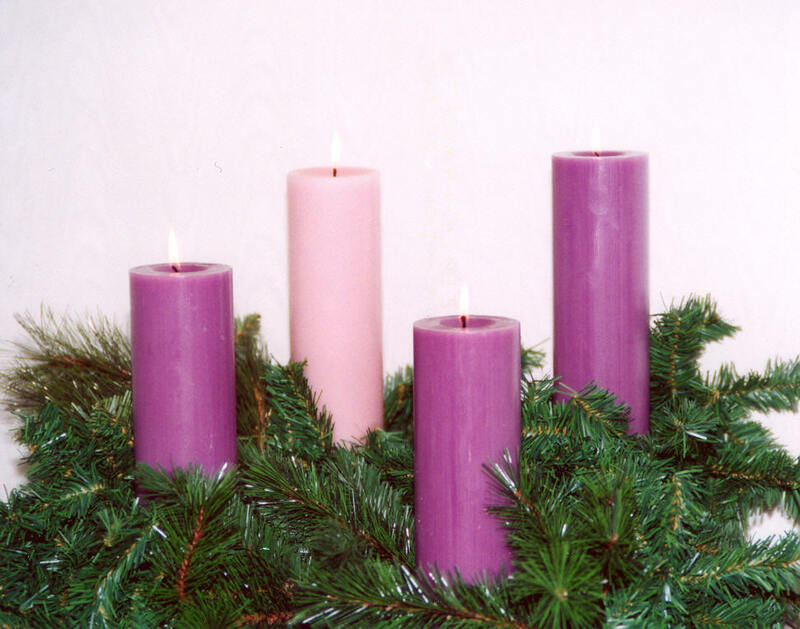 Will we salvage this Advent in its waning moments, It's now or never. God is giving us these final hours to really prepare. Let us pray that we are equal to the task. Finally, Mary's "fiat" teaches us that she is intrinsically tied to the Eucharist. Each time we look at the Blessed Sacrament, we not only see Jesus in his body, blood, soul and divinity, we see the Father, the Spirit and our Lady - who gave him flesh so that he could become man and die as the perfect oblation to the Father. As every priest says, "This is my body", so too does Mary when she accepts motherhood of the Savior and says in her unique way, THIS IS MY BODY. Mary is therefore an essential component in the Eucharistic miracle. I would suggest that we each take time today to meditate on the first joyful mystery of the rosary - the Annunciation. If you are not in the habit of praying the Angelus at noon, it is easily culled off of the internet. Praying the Angelus, which is a traditional prayer based on today's Gospel, is a wonderful way to take a break at noon each day to honor one of the greatest events in human history and to honor the Mother of God, asking for her intercession. Let us ask Mary to teach us how to pray and to lead us to her son. And like Mary, may our prayers join that of the Psalmist in recognition of the awesomeness of the mystery of the Incarnation as we repeat our antiphon over and over again into Christ - Forever I will sing of the goodness of the Lord.